Every model requires an appropriate set of boundary conditions to represent the system’s relationship with the surrounding systems. In the case of a groundwater flow model, boundary conditions will describe the exchange of flow between the model and the external system. In the case of a mass transport model, the boundary conditions will also describe the exchange of solute mass between the model and the external system. The pumping well boundary condition is used to simulate wells (or other features) that withdraw water from or add water to the model at a constant rate during a stress period, where the rate is independent of both the cell area and head in the cell. For finite difference translations, Visual MODFLOW Flex uses the Well (WEL) package, provided with MODFLOW. The MODFLOW input data for Well cells is stored in the projectname.WEL file. You can define the location for horizontal or deviated wells, which include the well path and the screen location. When you translate your conceptual model to MODFLOW format, the horizontal well screen location is converted to set of pumping well cells side-by-side. Another option is to define a specified flux or drain boundary condition in VMOD Flex. These are the workarounds, since there is no MODFLOW package for horizontal wells. For finite element model translations, VMOD Flex translates the pumping well boundary conditions as a Type 4 (Well) boundary condition. Please note that the defined screen interval must extend beyond half of the element height for it to be assigned the boundary condition. Currently, deviated/horizontal well translation is not supported for finite element models. If you intend to translate to FEFLOW, please make sure all pumping well boundary conditions are defined using vertical wells. In VMOD Flex, pumping well boundary conditions are defined using the well data contained in a wells data object. During the boundary condition creation process, you will be required to select a wells data object from the Data Explorer. For information on importing well data, please see "Importing Wells" section. Currently, this boundary condition is only supported for Finite Difference Model translation. 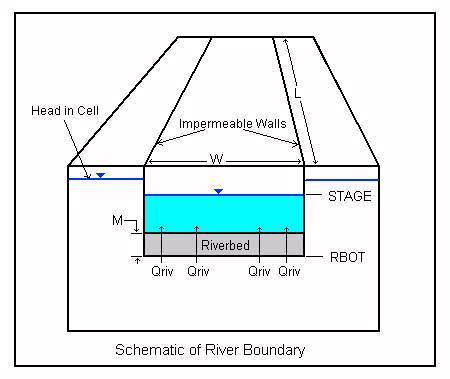 The Specified Head boundary condition, also known as Constant Head in VMOD Flex, is used to fix the head value in selected grid cells regardless of the system conditions in the surrounding grid cells, thus acting as an infinite source of water entering the system, or as an infinite sink for water leaving the system. Therefore, specified head boundary conditions can have a significant influence on the results of a simulation, and may lead to unrealistic predictions, particularly when used in locations close to the area of interest. During translation, VMOD Flex uses the Time-Variant Specified-Head Package provided with MODFLOW. The MODFLOW input data for Specified Head cells is stored in projectname.CHD file. Unlike most other transient MODFLOW boundary condition packages, the Specified-Head package allows the specified heads to be linearly interpolated in time between the beginning and end of each stress period, such that the specified head for a grid cell may change at each time step of a given stress period. If the simulation is steady-state, the specified starting head value will be used. Some Type-3 (Head-Dependent Flux) boundary conditions (e.g. river and general head) require defining a conductance parameter (for MODFLOW). Conductance is a numerical parameter representing the resistance to flow between the cell assigned with that boundary condition and the surrounding cells. Conductance between cells is calculated using some average hydraulic conductivity of the cells, the area of the interface between the cells and the distance between the cell centers. The Conductance calculation requires the cell geometry (cell interfaces). In Visual MODFLOW Flex, when you create a new conceptual boundary condition, this is done using shapes: polyline, polygon, and side faces. At this point, there is no notion of cell geometry, as a result, the conductance cannot be calculated since the cell face area cannot yet be calculated. For this reason, you are asked to define "Leakance" instead of "Conductance". Leakance is a conceptual (hydrogeological) term, and is expressed per unit area (if the conceptual boundary condition object is a polygon) or per unit length (if the conceptual boundary condition object is a polyline). When you create the boundary condition, the Leakance can be calculated based on other defined parameters, or it can be explicitly defined. When you look at the numerical representation (cell realization) of the boundary condition, you will see "Conductance" as the parameter, since this value can be calculated based on the intersecting cell geometry. For a boundary condition assigned with a polygon or side face, the Leakance is multiplied by the cell area, in order to get Conductance. For a boundary condition assigned with a polyline, the Leakance is multiplied by the length of the line that intersects the cell, in order to get the Conductance. The River boundary condition is used to simulate the influence of a surface water body on the groundwater flow. Surface water bodies such as rivers, streams, lakes and swamps may either contribute water to the groundwater system, or act as groundwater discharge zones, depending on the hydraulic gradient between the surface water body and the groundwater system. For finite difference models, VMOD Flex uses the River Package included with MODFLOW. The MODFLOW input data for River grid cells is stored in projectname.RIV file. Currently, translation of river boundary conditions is not supported for finite element (FEFLOW) translations. The MODFLOW River Package simulates the surface water/groundwater interaction via a seepage layer separating the surface water body from the groundwater system (see following figure). •River Stage: The free water surface elevation of the surface water body. This elevation may change with time. •Riverbed Bottom: The elevation of the bottom of the seepage layer (bedding material) of the surface water body. •Conductance: A numerical parameter representing the resistance to flow between the surface water body and the groundwater caused by the seepage layer (riverbed). For situations where the River package is used to simulate lakes or wetlands, the L and W variables would correspond to the X-Y dimension of the River boundary grid cells. When a River boundary condition is assigned, the Use default Leakance option is automatically selected. •Riverbed Thickness: Thickness of the riverbed (seepage layer) [L]. If the Use default Leakance option is turned off, the fields used for calculating the River Leakance value (Riverbed Thickness, Riverbed Kz, and River Width) are removed from the table, and the Leakance field becomes a writable field where a value may be entered. For finite difference models, VMOD Flex supports translation of the General-Head Boundary Package included with MODFLOW. The MODFLOW input data for General-Head grid cells is stored in the projectname.GHB file. Currently, for finite element models, translation of this boundary condition is not supported. The function of the General-Head Boundary (GHB) Package is mathematically similar to that of the River, Drain, and Evapotranspiration Packages. Flow into or out of a cell from an external source is provided in proportion to the difference between the head in the cell and the reference head assigned to the external source. 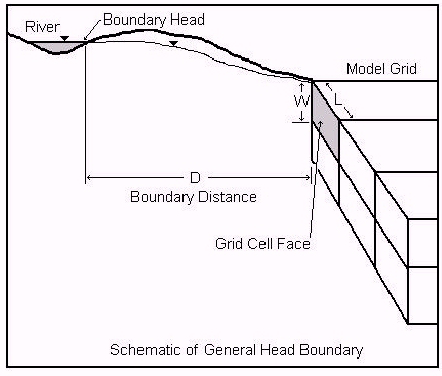 The application of this boundary condition is intended to be general, as indicated by its name, but the typical application of this boundary condition is to represent heads in a model that are influenced by a large surface water body outside the model domain with a known water elevation. The purpose of using this boundary condition is to avoid unnecessarily extending the model domain outward to meet the element influencing the head in the model. As a result, the General Head boundary condition is usually assigned along the outside edges (sides) of the simulation model domain. This scenario is illustrated in the following figure. •the model solves for the head values in the General-Head grid cells whereas the head values are specified in Constant Head cells. •the General-Head grid cells do not act as infinite sources of water whereas Specified Head cells can provide an infinite amount of water as required to maintain the specified head. Therefore, under some circumstances, the General-Head grid cells may become dry cells. •Stage: This is the head of the external source/sink. This head may be physically based, such as a large lake, or may be obtained through model calibration. •Conductance: The is a numerical parameter that represents the resistance to flow between the boundary head and the model domain. In contrast to the River, Drain, and Evapotranspiration packages, the General Head package provides no limiting value of head to bind the linear function in either direction. Therefore, as the head difference between a model cell and the boundary head increases/decreases, flow into or out of the cell continues to increase without limit. Accordingly, care must be used to ensure that unrealistic flows into or out of the system do not develop during the simulation. When a General-Head boundary condition is assigned, the Use default leakance option is automatically selected. If the "Use default conductance" formula option is not selected, the fields used for calculating the General-Head Conductance value (Distance to Reservoir, Average Conductivity) are removed from the table, and the Leakance field becomes a writable field where a value may be entered. The geometry for General-Head boundary conditions can be specified using a polygon data objects. For finite difference models, VMOD Flex supports the standard Drain Boundary Package included with MODFLOW. The MODFLOW input data for Drain grid cells is stored in the projectname.DRN file. Currently, for finite element model translation, this boundary condition is not supported. MODFLOW's Drain Package is designed to simulate the effects of features such as agricultural drains, which remove water from the aquifer at a rate proportional to the difference between the head in the aquifer and some fixed head or elevation. The Drain package assumes the drain has no effect if the head in the aquifer falls below the fixed head of the drain. •Elevation: The drain elevation, or drain head of the free surface of water within the drain. The drain is assumed to run only partially full, so that the head within the drain is approximately equal to the median elevation of the drain. •Leakance: The drain leakance is a lumped coefficient describing the head loss between the drain and the groundwater system. This loss is caused by converging flow patterns near the drain, the presence of foreign material around the drain, channel bed materials, the drain wall, and the degree to which the drain pipe openings may be blocked by chemical precipitates, plant roots, etc. There is no general formulation for calculating drain leakance. In most situations, the detailed information required to calculate drain leakance is not available to the groundwater modeler. These details include the detailed head distribution around the drain, aquifer hydraulic conductivity near the drain, distribution of fill material, number and size of the drain pipe openings, the amount of clogging materials, and the hydraulic conductivity of clogging materials. It is common to calculate drain leakance from measured values of flow rate and head difference. Drain leakance value is usually adjusted during model calibration. If the Use default leakance option is turned off, the fields used for calculating the Drain Leakance value (Leakance per unit length or area) are removed from the table and the Leakance field becomes a read/write field where any value may be entered. For finite difference models, Visual MODFLOW Flex supports the Recharge Package (RCH) included with MODFLOW. The Recharge input data for MODFLOW is stored in the projectname.RCH file. For finite element models, recharge boundary conditions are translated as the In(+)/Out(-)flow material parameter. The recharge boundary condition is typically used to simulate surficially distributed recharge to the groundwater system. Most commonly, recharge occurs as a result of precipitation percolating into the groundwater system. However, the recharge boundary can potentially be used to simulate recharge from sources other than precipitation, such as irrigation, artificial recharge, or seepage from a pond. •Recharge (L/T): The input flux due to recharge. The recharge is applied in one of three ways as part of the package translation settings: 1. recharge is applied only to cells in layer 1, 2. recharge is applied to cells the specified layer, 3. recharge is applied to the upper-most active cell. See the documentation in the Recharge Translation Settings documentation for more details. •Ponding (L) [optional, only used in the MODFLOW-SURFACT engine]: The maximum allowable depth of the water table above the ground surface. Calculated heads elevations above this depth (+ground surface) are truncated by the model. Please Note: MODFLOW-SURFACT simply removes excess ponded water from the model without routing it to other cells. The geometry for Recharge boundary conditions can be specified using polygon data objects and by points, and for an entire layer. For finite difference models, Visual MODFLOW Flex supports the Evapotranspiration Package (ET) included with MODFLOW. After translation, the Evapotranspiration input data for MODFLOW is stored in the projectname.EVT file. Currently, this boundary condition is not supported for finite element translation. The evapotranspiration boundary condition simulates the effects of plant transpiration, direct evaporation, and seepage at the ground surface by removing water from the saturated groundwater regime. •When the water table is at or above the ground surface (top of layer 1), evapotranspiration loss from the water table occurs at the maximum rate specified by the user. •When the elevation of the water table is below the ‘extinction depth’, or is beneath layer 1, evapotranspiration from the water table is negligible. Between these limits, evapotranspiration from the water table varies linearly with water table elevation. •Evapotranspiration rate: The rate of evapotranspiration as it occurs when the water table elevation is equal to the top of the grid cell elevation. This value should be entered in the units set for recharge as defined in the Project Settings. •Extinction Depth: The depth below the top of grid cell elevation where the evapotranspiration rate is negligible. When the water table is at or above the ground surface (top of layer 1), evapotranspiration loss from the water table occurs at the maximum rate specified by the user. When the elevation of the water table is below the ‘extinction depth’, or is beneath layer 1, evapotranspiration from the water table is negligible. For finite difference models, Visual MODFLOW Flex supports the Lake (LAK3) package for MODFLOW. After translation, the Lake input data for MODFLOW is stored in the projectname.LAK file. Currently, translation of this boundary condition is not supported for finite element models. The lake boundary condition can be used to simulate the effects of stationary surface-water bodies such as lakes and reservoirs on an aquifer. The lake boundary is an alternative to the traditional approach of using the general head boundary condition. The main difference in the lake boundary is that the lake stage is calculated automatically based on the water budget, which is a function of inflow, outflow, recharge, etc. For more information on the Lake package, please refer to USGS publication, Documentation of a Computer Program to Simulate Lake-Aquifer Interaction Using the MODFLOW Ground-Water Flow Model and the MOC3D Solute-Transport Model. •Stage [L]: The initial stage of the lake at the beginning of the run. •Bottom [L]: The elevation of the bottom of the seepage layer (bedding material) of the surface water body. •Lakebed Thickness [L]: Thickness of the lakebed (seepage layer). •Lakebed Conductivity [L]: Vertical hydraulic conductivity of the lakebed material. •Precipitation Rate per Unit Area [L/T]: The rate of precipitation per unit area at the surface of the lake. •Evaporation Rate per Unit Area [L/T]: The rate of evaporation per unit area from the surface of the lake. •Overland Runoff [L3/T]: Overland runoff rate from an adjacent watershed entering the lake. •Artificial Withdrawal [L3/T]: The volumetric rate of water removal from a lake by means other than rainfall, evaporation, surface outflow, or ground-water seepage. Normally, this would be used to specify the rate of artificial withdrawal from a lake for human water use, or if negative, artificial augmentation of a lake volume for esthetic or recreational purposes. If the Use default Leakance option is turned off, the fields used for calculating the River Conductance value (Lakebed Thickness, Lakebed Kz) are removed from the table, and the Leakance field becomes a writable field where a value may be entered. When you create the flux object, the value you define should be the flux per unit length (when using polyline) or per unit area (for polygon). When the cell realization is calculated, then VMOD Flex will calculate the flux for each cell based on the length of the line that passes thru the cell (for polyline) or the cell area (for polygon). For these reasons, you will see a significant difference in the parameter values for the conceptual object (shape) vs. the summed values for all cells (the cell realization). For finite difference models, VMOD Flex supports the Specified Flux (FHB1) package for MODFLOW. After translation, the specified flux input data for MODFLOW is stored in the projectname.FHB file. Currently, translation of this boundary condition is not supported for finite element models. •FHB1 package can simulate specified-flux on the top, side, bottom or intermediate layers in the simulation domain, whereas the recharge package can only be applied to the top and intermediate layers. •FHB1 package allows you to specify a starting flux and an ending flux (for each stress period, if transient). The package then uses linear interpolation to compute values of flow at each model time step. For more information on the Specified-Flow (FHB1) package, please refer to Documentation of a Computer Program (FHB1) for Assignment of Transient Specified-Flow and Specified-Head Boundaries in Applications of the Modular Finite-Difference Ground-Water Flow Model (MODFLOW, Open-File Report 97-571, U.S. Geological Survey). The reference values of these properties are assigned in the standard format associated with the BCF4 package. These reference values are then scaled by factors assigned in the TMP1 package, where the factors are time-dependent over the simulation period. •Leakance Scaling [-]: the scaling factor by which the base vertical leakance values will be multiplied for the associated stress period. •Sy Scaling [-]: the scaling factor by which the base specific yield values will be multiplied for the associated stress period. •Ss Scaling [-]: the scaling factor by which the base specific storage values will be multiplied for the associated stress period. Please Note: the Kzz and Leakance Scaling factors are mutually exclusive and which one is used is based on the settings in the BCF4 package. The geometry for time-varying material boundary conditions can be specified using polygon or polyline data objects or on a cell-by-cell basis.